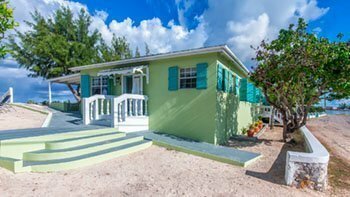 Crabtree Apartments is located directly on the beach in a quiet residential area of Grand Turk. There are 3 quaint 2 bedroom apartment units, nestled side-by-side on a lovely white sand beach. Each unit is unique in it’s own way but all three apartments have a similar layout. Units #2 and #3 have connecting doors between the units allowing the two units to act like one unit for larger families and groups. Unit #1 is our smallest unit, however it is the most private unit set off somewhat by itself. 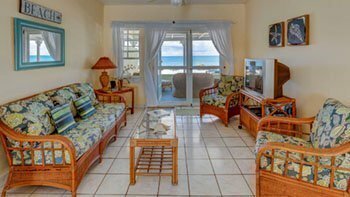 The living room, dining area and kitchen are one large room front to back allowing the tropical breeze to flow through the windows and doors with inviting views of the Caribbean Sea. They are furnished with comfortable rattan in a tropical beach decor. It’s a great place to enjoy the breeze and watch a movie or show, read a book or take a nap. Each unit has a flat screen TV and a DVD player with a collection of movies and books for you to enjoy as well as board games to entertain you. Sleep comes easy here with the cool night breezes and the sound of the waves gently lapping outside your window. The beach front, air-conditioned bedroom boasts ocean views and a door to access your units private veranda. Units 2 and 3 are equipped with a comfortable king size bed. Unit 1 is furnished with a comfortable queen size bed. The Salina view bedroom in all three units is air-conditioned and has 2 twin beds that can be converted into a king bed. 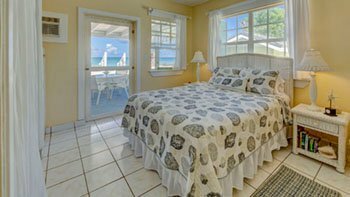 This bedroom has 2 large windows to let in the wonderful tropical breezes and offers views of the Salina and all the wildlife it attracts. 100% cotton sheets and all bed linens are included. The bathroom is situated directly between both bedrooms. 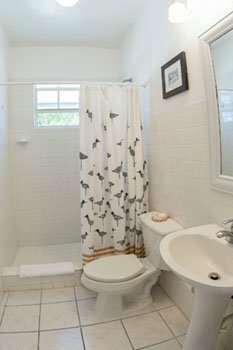 It has a large tile shower and white fixtures. We include, plenty of bath towels, hand towels and facecloths as well as 4 beach towels and a first aid kit. The kitchen is part of one large room including the living room. 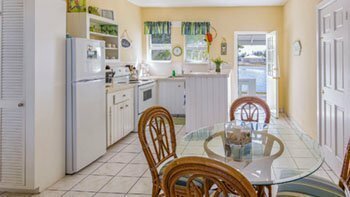 It is equipped with a full range with oven, a full refrigerator with freezer, microwave, toaster, blender and coffee maker. There are plenty of pots and pans, glassware, dishes and linens provided for you as well as some basic spices and food items to get you started. 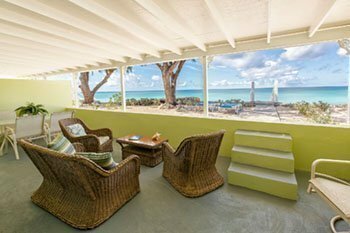 The kitchen windows look out over the Salina and bring in the wonderful tropical breeze. The veranda is sure to be your favorite place to relax. Each unit has it’s own private veranda furnished with comfortable teak furniture and a dining table with chairs. Put your feet up and enjoy a good book or simply relax and enjoy the views. You will enjoy breakfast here as you watch the water color change from royal blue to a vibrant turquoise as the sun rises in the sky. Sunsets are equally as amazing in the evening. Each unit comes equipped with 2 chaise loungers where you can soak up the sun and take pleasure in the beautiful view. If you get a little too warm simply take a few steps down to the beach and take a dunk in the refreshing waters, or duck inside for a cold drink to refresh you, all the amenities of your own apartment are literally a step away. A wonderful white sand beach is literally outside your door. Just step from your veranda, down a few steps and you are there! Each unit is equipped with 2 beach chairs for use on the beach. 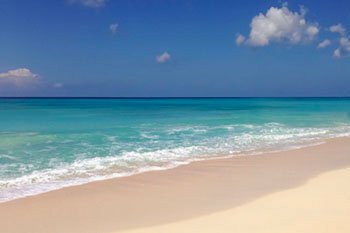 Sit in a chair on the beach and let the warm Caribbean sea lap at your feet! 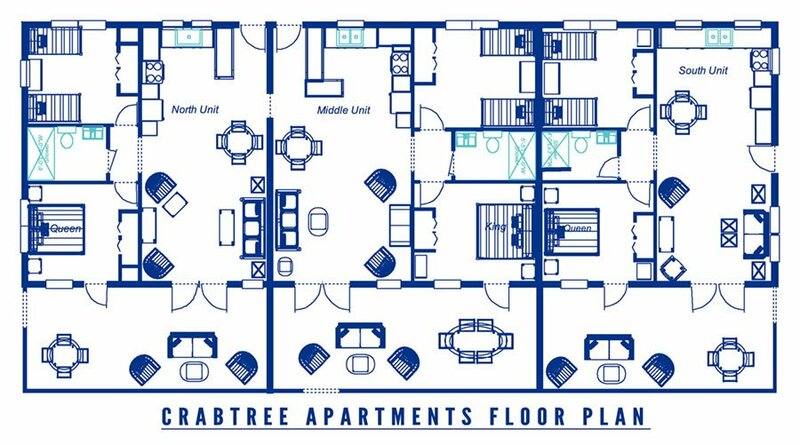 Crabtree Apartments is located only a short 10 minute or so walk to town and restaurants. You will enjoy the walk under the stars at night as you head out to dinner and back as the tranquil tropical breeze flows around you. Each unit is equipped with 2 bicycles for your use to explore the island. 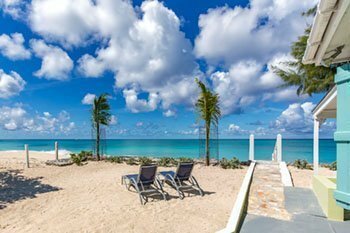 There are so many wonderful spots to relax and enjoy the solitude here at Crabtree Apartments on the beautiful beach of Grand Turk. You won’t return home the same person. In fact, you most likely will not be ready to leave, so be sure to book extra days if you can! Time and time again our guests tell us they wished they had booked a longer stay.